See the quotation of the day here. It’s 2018, and Female Candidates Are Tweeting About Lipstick. Is This Progress? So it’s remarkable that here we are eight years later, and there’s a candidate—a young progressive candidate, no less—who’s not only fielding questions about her appearance but doing so voluntarily, with the enthusiasm of a genuine beauty junkie. “I’ve never seen anything like it before,” says Chris Jahnke, a Washington, D.C.-based speech coach who was a consultant on Clinton’s 2008 campaign and has worked with Michelle Obama. “It goes against the conventional wisdom of how women candidates should act.” Read the full story here. Do Women Have to Talk Like Men to Be Taken Seriously? And Should They? This female vocal coach teaches women how to talk without being called angry or shrill. The balloons hadn’t even begun to drop after Hillary Clinton’s speech at the Democratic National Convention this summer when pundits started scoring the way she sounded. There was Brit Hume of Fox News complaining about Clinton’s “not-so-attractive voice” and saying, “She tends to accelerate her delivery and speak louder and sterner.” There was New York Times columnist David Brooks demanding more “humanity” from the country’s first female presidential nominee: “She projects one emotional tone throughout, and it has a combative manner to it, and not a happy warrior manner.” Donald Trump himself took to Twitter to chastise Clinton’s “very average scream.” None of this would have come as a surprise to any woman who’s run for office. Read the full story here. “The summary of how it feels is like every day you’re drinking from a fire hose,” Abedin explains one evening, about the constant onslaught of her job. Wearing a pink-and-navy print dress, she is sitting in her light-filled corner office in Clinton’s downtown Brooklyn headquarters. One wall is covered with framed photos of the candidate. … On the shelves are Clinton’s Hard Choices; Dana Thomas’s Gods and Kings, about Alexander McQueen and John Galliano; and Christine K. Jahnke’s The Well-Spoken Woman: Your Guide to Looking and Sounding Your Best. Read the full story here. Speech and debate coach Chris Jahnke has advised a number of female candidates and leaders, including New Hampshire Governor Maggie Hassan and First Lady Michelle Obama. She discusses the gender dynamics at work in last night’s debate, and the particular ways in which women are expected to behave on stage while debating men. Listen to the full radio interview here. Christine Jahnke previews the Democratic presidential debate. Listen to the full radio interview here. Medium: Third woman in a row to deliver SOTU response. Does it matter? South Carolina Gov. Nikki Haley will be the third woman in a row selected to deliver the Republican response to the President’s State of the Union address. Does it matter that another woman will be laying out the opposition party’s policy agenda? Read the full op-ed here. When debate coach Chris Jahnke schools women in public speaking, she likes to start with this: “Let your inner diva come out.” The author of The Well-Spoken Woman and founder of Positive Communications says that women need to understand how important it is to own their own voices. Read the full article here. Memo to Women Candidates Part II: What Kind of Debater Are You? 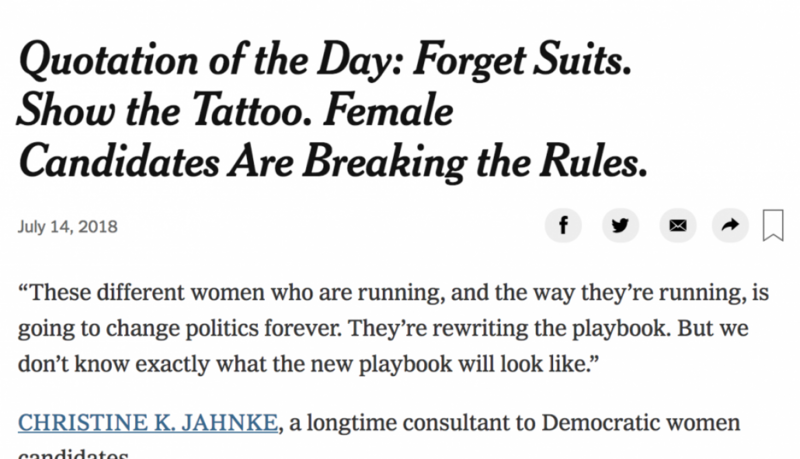 In GenderWatch, Chris Jahnke writes, “Everyone advises you to ‘just be yourself.’ But how is that possible under hot TV lights, inches from an opponent, with reporters waiting to pounce on any misstep? What can be done in advance to present your best self?” Read the full article here. In GenderWatch, Chris Jahnke writes, “Women candidates running for executive posts in 2016 should watch and learn from the first Democratic primary debate. What candidates see and hear from the presidential contenders can jump start their own debate prep regimen.” Read the full article here.